I love to eat achar with nasi lemak, or just plain rice. Part of my plan for simple living is that ultimately when we retire one day, we'd be able make do with as little store bought things as possible. I plan to bake my own bread at home, make my own jam, pickles and basically make things from scratch when I can. So I thought I had better start practising now. This homemade achar is not difficult to make. 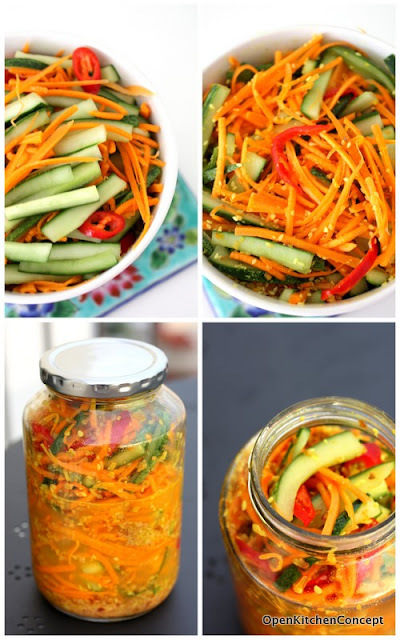 The good thing about making your own achar is that you decide what you want to put in it. I like only 3 things in my achar - cucumber, carrots and pineapple, so I omitted any cauliflower, long beans and other vegetables I didn't like. I forgot that I used up all the pineapples the day before for my Prawns in Pineapple Gravy, so I didn't have that as well. The achar is good to eat immediately but should taste better after a day or two. Indeed a simple recipe. No blanching, no frying also. Hi Sinfonia, I like your new profile pic! Do try this and let me know how it goes! Sound very simple! I should try this! Do give it a try Malar!